1. Sincerity of intention: That it should not be done for anyone other than Allaah, neither for seeking the praise from the creation nor for some worldly benefits. Whoever intends with it other than Allaah’s pleasure has committed shirk. 2. Following the Prophet صلى الله عليه وسلم: Following the Prophet صلى الله عليه وسلم in the manners and the ways of doing the acts of `Ibaadah. So whoever adds to it or deducts from it or changes the time or the place or the number (of times) or the manner (i.e. the wordings) or form – then he has invented a matter different than that of the Prophet صلى الله عليه وسلم and has (by the way of his actions) claimed that his method is better than the guidance of the Prophet صلى الله عليه وسلم. So whoever stops following will fall into Bid`ah. And how many have fallen into Bid`ah. They say that their intention was good; but intention alone is not sufficient to justify the actions. a. Time: A lot of acts of `Ibaadah are bounded by time. A person is not allowed to deliberately do a thing before or after the said times. Example: a person cannot pray Maghrib before the Sunset; a person is not allowed to continue fasting after the Sun has set; the slaughter for Eid al-Adhha is to be done only after praying the Eid prayer; Zakaat al-Fitr is to be given before the Eid prayer etc. b. Place: Some acts of `Ibaadah are bounded by place. Example: Tawaaf is to be done only around the Ka`bah. `itikaaf is to be done in the Masjid only. On the 9th of Dhul-Hijjah, the pilgrims have to be in `Arafah; anyone who does not reach this place on this day, have missed their Hajj. 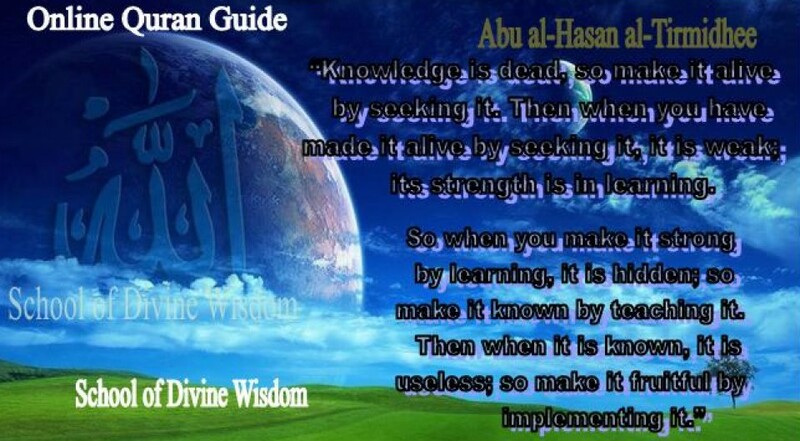 c. Reason: Some acts of `Ibaadah are done due to a reason involved in it. Example: “Sajdah al-Shukr” (Sajdah of thankfulness) is done when a person receives some pleasant news etc. and “Sajdah al-Tilaawah” (Sajdah due to recitation). Both these reasons are proven from the Sunnah. But doing a Sajdah specifically for making Du`aa, then this reason is not proven from the Sunnah. Marking out the days for Eid Milaad al-Nabee, or for the night of al-Israa wal_Mi`raaj, is not proven from the Sunnah or the actions of the Salaf as-Saaleh. d. Form: Certain acts of `Ibaadah have been prescribed on certain occasion. Example: Reciting the Qur’aan is a good act and from the best of worships; but as per the Sunnah, the pilgrims on their way to Makkah have to say the Talbiyah. So anyone who recites the Qur’aan instead of the Talbiyah, then he has gone against the Sunnah. Another example: in the state of anger, a person should seek refuge in Allaah from the accursed Shaitaan by saying A`oodhu billaahi min ash-shaitaan ar-rajeem, and this is the Sunnah. But if instead a person prays for blessings upon the Prophet صلى الله عليه وسلم or something else, then he has gone against the Sunnah. One more: Zakaat al-Fitr is to be given in the form of food grains (rice, raisins, dates etc.) only. Anyone giving away cash instead has not followed the Sunnah. e. Characteristic: Deliberately missing on some of the acts of Sunnah. Example: the Ahaadeeth are clear and authentic that the person should say “Aameen” after the Imaam has recited al-Faatihah. So anyone who does not recite it, after the truth has come to him, has gone against the Sunnah. Another example is that in prayer, everything has to be performed in order and in sequence. Anyone who changes the order – example prostrating before bowing or deliberately prays Maghrib as 4 instead of 3 – then his prayer becomes void. f. Number (of times): Any additions or deductions are not allowed. There are 7 rounds in Tawaaf around the Ka`bah; each prayer has certain units in it; certain adhkaar have to be done specific number of times – so a person is not allowed to exceed this numbers nor reduce them deliberately. So, no matter how good the intention is, if it is not in accordance with the Sunnah, it will be rejected. And Allaah is the Granter of success.